Mahjongg, Mah Jongg, Mahjong, Mah Jong. There are many ways to spell it and many more ways to play it. If you want a simple and well thought out set of rules to play by then look no further, the IMPAH rules play a great game and are concise enough to only cover two sides of A4 paper! Why Mahjong IMPAH Rules? Mahjong Rules Sheet. Mahjong Scoring Table. Championship Rules. 2009 Championship Stats, Match 8 (Nov '09). Winning Match Score, Ian = 264. Cumulative Average Match Score = 325. Cumulative Average Hand Score = 41. Ian leads on Championship Points = 3112. Hilary and Ian lead on Matches Won = 3. Hilary leads on Mahjongs Won = 19. Highest Hand Score so far this Championship, Ian = 1408. If you would like the IMPAH scoring excel file emailed to you for your own use then request it from: impahrules at googlemail dot com. 2009 Championship Stats, Match 7 (Oct '09). Winning Match Score, Hilary = 482. Cumulative Average Match Score = 340. Cumulative Average Hand Score = 42. Hilary leads on Championship Points = 2912. Hilary leads on Matches Won = 3. Hilary leads on Mahjongs Won = 18. 2009 Championship Stats, Match 6 (August '09). Winning Match Score, Mel = 380. Cumulative Average Match Score = 353. Cumulative Average Hand Score = 43. Ian leads on Championship Points = 2634. Hilary, Ian and Mel lead on Matches Won = 2. Hilary leads on Mahjongs Won = 15. 2009 Championship Stats, Match 5 (May '09). Winning Match Score, Ian = 436. Cumulative Average Match Score = 369. Cumulative Average Hand Score = 51. Ian leads on Championship Points = 2488. Hilary & Ian lead on Matches Won = 2. Hilary leads on Mahjongs Won = 13. 2009 Championship Stats, Match 4 (April '09). Winning Match Score, Ian = 1516. Cumulative Average Match Score = 400. Cumulative Average Hand Score = 45. Ian leads on Championship Points = 2052. Hilary leads on Matches Won = 2. Mel leads on Mahjongs Won = 11. If you would like the IMPAH scoring excel file emailed to you then request it from: impahrules at googlemail dot com. 2009 Championship Stats Match 3 (Mar '09). Winning Match Score, Mel = 586. Cumulative Average Match Score = 316. Cumulative Average Hand Score = 36. Hilary leads on Mahjongs Won = 8. Highest Hand Score so far this Championship, Hilary = 640. 2009 Championship Stats Match 2 (Jan '09). Winning Match Score, Hilary = 274. Cumulative Average Match Score = 335. Hilary and Mel lead on Mahjongs Won =5. 2009 Championship Stats Match 1 (Jan '09). As it was the start of a new season (2009) we decided to make a small change to our tournament. This year each match will consist of eight hands instead of sixteen. Winning Match Score, Hilary = 870. Average Match Score = 461. Average Hand Score = 58. Hilary leads on Matches Won = 1. Hilary leads on Mahjongs Won =3. 2008 Championship Statistics (December '08). After five matches Peter and Ian have won two matches each. Hilary has won one match and Mel has won none. Although Ian and Peter drew on matches, Peter sneaks first place on championship points. All scores are now reset to zero for the 2009 season. 2008 Championship Statistics (November '08). After four matches Peter has won two matches, Ian and Hilary are drawn on one match each; holding equal second place. Mel is in fourth place. Peter leads on Cumulative Score (2826). Peter leads on Mahjongs Won (24). Highest Hand Score so far, Hilary (884). Average Match Score = 403. Average Hand Score = 101. 2008 Championship Statistics (October '08). Peter leads on Cumulative Score (2396). Peter leads on Mahjongs Won (22). Average Match Score = 410. Average Hand Score = 102. Mahjong Rules Sheet (Three Player). Just in case you ever need to play three handed. 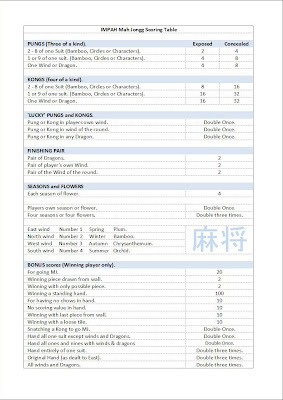 Here is a copy of the Three Player Mahjong IMPAH Rules Sheet. Click on the picture to expand the image. If you would like this file emailed to you then request it from: impahrules at googlemail dot com. 2008 Championship Statistics (August '08). After three matches Ian, Peter and Hilary are drawn on one match each and holding equal 1st place, Mel is in fourth place. Hilary leads on Cumulative Score (1552). Ian leads on Mahjongs Won (16). Average Match Score = 451. Each 'Hand' winner is decided by the player who calls Mahjong. Each 'Match' (16 hands) winner is decided by the player with most points, if points are drawn then all drawing players win and are marked as taking equal 1st place. Each ‘Championship’ (one per year, or more depending on frequency of play) winner is decided by the player winning most matches, if drawn then the highest number of championship points are considered, if drawn the highest number of Majongs called are considered. If still drawn then all drawing players win and are marked as taking equal 1st place in the championship. The four of us have been playing Mahjong together for several years. We have always had great fun but been a little frustrated at the multitude of different rule sets in use. They range from exhaustingly complicated to over simplified, varying from one country to another and the period they were written. A while back we heard that a new international standard set of rules had been written, one of the advantages was said to be that all players could now play the same game. We bought a book on the new rules only to discover that the new ‘standard’ had been made horrendously complex with any given hand having the same tiles scoring multiple times in some cases. Ironically we went from searching for a standard set of rules to compiling our own! We set ourselves the goal of designing a set of rules that kept much of the traditional play while keeping the game manageable and accessible to new players. We managed to distil the game play down to one double sided page making it portable and convenient to refer to when playing. So here they are; the ‘Mahjong IMPAH Rules’, we hope they will give you an enjoyable game! Here is a copy of the Mahjong IMPAH Rules Sheet. Click on the picture to expand the image. If you would like this file emailed to you then request it from: impahrules at googlemail dot com. Here is a copy of the Mahjong IMPAH Scoring Table. Click on the picture to expand the image. If you would like this file emailed to you then request it from: impahrules at googlemail dot com. If you have found the rules and score sheets on this site useful then please make a donation.